This dish is bursting with colour and flavour - a guaranteed crowd-pleaser! Put the pork on a roasting tray and drizzle with the oil, then rub in the sage, rosemary, thyme and a pinch of salt and pepper. Roast the pork in the oven for 45 to 50 minutes, until cooked through. When the pork is done, remove it from the oven and let it rest for 10 minutes, loosely covered with a tent of foil, before carving. Meanwhile, to prepare the hasselback potatoes, cut the potatoes into thin slits by cutting almost through for each slice but without cutting all the way down – the incisions should go about three-quarters of the way down. Place the potatoes on a baking tray, drizzle with the oil and sprinkle with the chilli flakes and a pinch of salt. Roast in the oven for about 30 minutes, basting from time to time, until cooked through. Remove from the oven and fill alternating slits with cheese, Parma ham and sage leaves. Put back in the oven for 15 minutes more just before serving. To make the butternut squash purée, melt the butter in a saucepan set over a medium heat. Add the butternut squash, onion and garlic. Cook for 10 to 15 minutes, until softened. Pour in enough vegetable stock to cover all the butternut squash mixture, then simmer on a medium heat for 20 minutes, covered with a lid. When the butternut squash is cooked through, carefully drain off the stock to a bowl and set aside. Using a hand blender, blitz the vegetables until smooth. Add some of the reserved cooking liquid and blitz again until the right consistency has been achieved. Check the seasoning and keep warm. 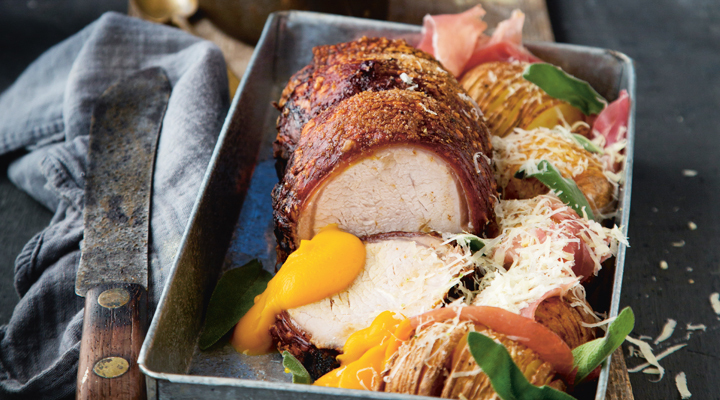 To serve, carve the pork and serve with the stuffed hasselback potatoes and butternut squash purée.